Complete control over lead types, regional coverage etc. Your dashboard is where to go to keep your Holmes Media account in order. You can control just about everything you’ll ever need so that you can get exactly what you want out of our service. We believe that being out on jobs all day shouldn’t mean that you miss out on potential customers, which is why we’ve made the dashboard accessible from anywhere – whether you’re on mobile, tablet or desktop. Brand new leads will appear in your dashboard within moments of us telephone-qualifying them, ready for you to turn into customers. Then once you’ve found and purchased leads, use the dashboard to keep a record of all your new customers. You can even save yourself the time of looking through all of our leads by setting up lead alerts. These free text and email notifications will make you aware of a lead that’s perfectly suited to your business so you can grab them straight away. Not only is your dashboard a space for securing new customers, it’s where you manage everything to do with your company too. We might have built the dashboard but you control it. You can set a cap on the number of leads coming your way. Going away? Put everything on pause until you’re back. All of this doesn’t have to be down to one person either, we know that companies come in all different sizes so you can create several users and even integrate it with your current systems. We can deliver leads to your inbox, via text or straight into your CRM. We only match customers to 3 companies so they can get a true comparison on price and service, but not every quote request we offer is purchased by a company straight away. If this happens we offer these leads to a wider network of companies so that the customer doesn’t go away empty handed and our installers don’t miss out on new work. You can access the marketplace via the dashboard and see customers who are waiting for quotes across the UK. If you’re accredited for the work required you’ll be able to purchase that lead. This is a great place to find customers for new areas of expansion for your business. For example, you may be primarily gas boilers but you’ve recently expanded into air source heat pumps. We want to make things simple when it comes to working with us. We only ever charge you for a lead, nothing else. 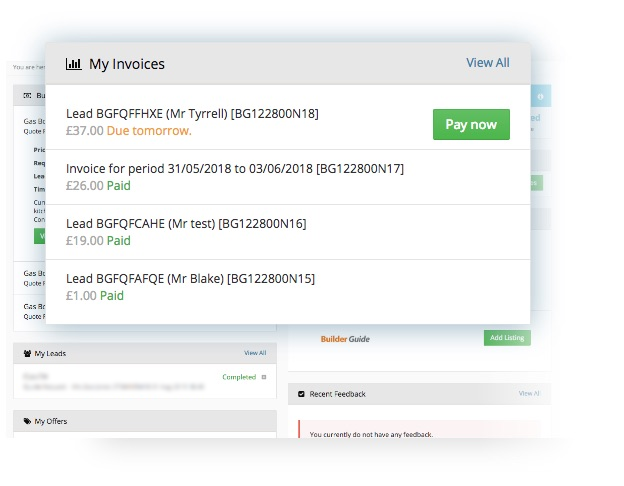 But with so many platforms to keep account of these days we‘ve made paying for leads really easy to suit your business size. This is your chance to stand out to the millions of people that visit our websites every year. By signing up, your company will benefit from a listing on our website and you’ll have full control over what it looks like. 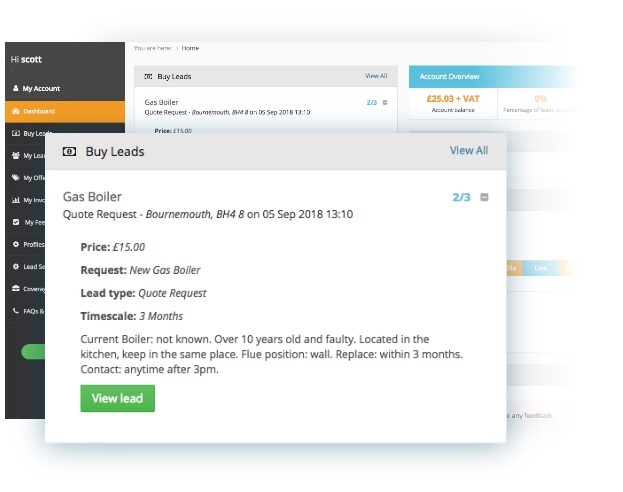 Start competing with other online boiler pricing services and meet the ever growing demand from consumers for online quotes with YouOffer – a unique platform to expand your company into the online quoting market. To top it all off, you’ll only be charged for the lead if you’re among the 3 companies chosen to provide a final quote.